This is the fifth in a series of stories over the coming weeks looking at various topics related to the response, the Natural Resource Damage Assessment science, restoration efforts, and the future of the Gulf of Mexico. APRIL 13, 2015 -- After an explosion took place on the Deepwater Horizon drilling platform in the Gulf of Mexico on April 20, 2010, responders sprang into action. Vessels surveyed the area around the platform, oil booms were deployed, aerial surveying operations were launched, risk assessment and shoreline cleanup teams set out, and many other response activities were underway. Field teams and technical experts from around the country were immediately called to help with the response. Among our many other responsibilities during this spill, NOAA's Office of Response and Restoration reported to the scene to help manage the data and information being collected to inform spill response decisions occurring across multiple states and agencies. The process of responding to an oil spill or natural disaster can often be described as "organized chaos." Effectively managing the many activities and influxes of information during a response is crucial. Responders need to be aware of the local environment, equipment, and associated risks at the scene of the spill, and government leaders from the closest town to Washington, DC, need to make informed decisions about how to deal with the event. Data-rich maps are one way to organize these crucial data into one common operational picture that provides consistent "situational awareness" for everyone involved. The Environmental Response Management Application (ERMA®) was developed by NOAA's Office of Response and Restoration, the U.S. Environmental Protection Agency, and the University of New Hampshire in 2007 as a pilot project, initially focused on the New England coast. ERMA is an online mapping tool that integrates both static and real-time data, such as ship locations, weather, and ocean currents, in a centralized, interactive map for environmental disaster response. In late March of 2010, ERMA was tested in a special oil spill training drill known as the Spills of National Significance Exercise. The industry representatives, U.S. Coast Guard, and state partners participating in this mock oil spill response recognized ERMA's potential for visualizing large amounts of complex data and for sharing data with the public during an oil spill. Twenty-five days later, the Deepwater Horizon disaster began. In the first couple of days after the accident, the ERMA team recognized that the scale of the still-developing oil spill would call for exactly the type of tools and skills for which their team had prepared. A few days into the disaster, the ERMA team created a new, regional version of their web-based mapping application, incorporating data specific to the Gulf of Mexico and the rapidly escalating Deepwater Horizon oil spill. This included geographic response plans (which guide responses to oil spills in specific areas), oil spill trajectories, and locations of designated response vessels, aerial surveys of oil, oiled shoreline assessments, critical habitats, and fishery closure areas. A few days into the disaster, the ERMA team created a new, regional version of their web-based mapping application, incorporating data specific to the Gulf of Mexico and the rapidly escalating Deepwater Horizon oil spill. Here, ERMA shows the location of the wellhead, the days of cumulative oiling on the ocean surface, and the level of oiling observed on shorelines. (NOAA) Click to enlarge. Due to the size of the spill, NOAA's Office of Response and Restoration was able to expand the team working on ERMA to include members skilled in data management and scientists familiar with the type of data being collected during a spill response. The ERMA team trained dozens of new Geographic Information Systems (GIS) staff to help upload and maintain the new Deepwater Horizon ERMA site as hundreds of data layers were created weekly. 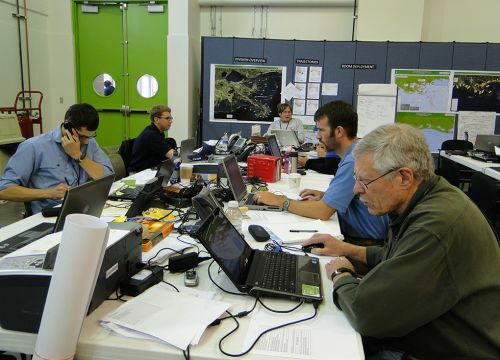 Within a week of the start of the oil spill, NOAA sent the first of many ERMA team members to work in the command posts in Louisiana, where they could translate the needs of the Federal On-Scene Commanders (those in charge of the spill cleanup and response) into updates and changes for ERMA software developers to make to the mapping application. ERMA played a critical role in the Deepwater Horizon oil spill response effort. Around a month into the spill, the U.S. Coast Guard selected ERMA as the official common operational picture for all federal, state, and local spill responders to use during the incident. With this special designation, the ERMA tool provided a quick visualization of the sprawling, complicated oil spill situation, and improved communication and coordination among responders, environmental stakeholders, and decision makers. On June 15, 2010 the White House presented a publicly accessible version of the Deepwater Horizon ERMA website, which drew more than 3 million hits the first day it was live. This was an unprecedented effort to make transparent data usually only shared within the command post of an oil spill. The value of the new tool to the response won it praise from retired Coast Guard Admiral Thad Allen, the national incident commander for the spill, who described its impact, saying, "It allowed us to have a complete picture of what we were doing and what was occurring in the Gulf. The technology has been there, but it's never been applied in a disaster that was this large scale. It is something that is going to have to incorporate this system into our disaster response doctrine." Additionally the NOAA development team was one of the finalists for the 2011 Samuel J. Heyman Service to America Medal for Homeland Security contributions by a member of the federal civil service. In addition to mapping the Deepwater Horizon response and cleanup efforts, ERMA continues to be an active resource throughout the ongoing Natural Resource Damage Assessment and related restoration planning. The Gulf of Mexico coastal resources and habitat data available in ERMA are helping researchers assess the environmental injuries caused by the oil spill. Five years after this mapping tool's debut on the national stage during the Deepwater Horizon oil spill, developers continue to improve the platform. NOAA now has nine other ERMA sites customized for various U.S. regions, each of which is kept up-to-date with basic information available around the clock and is publicly available. All regional ERMA websites now reside in the federally approved Amazon Cloud environment for online scalability and durability, and the platform has a flexible framework for incorporating data sources from a variety of organizations. The Deepwater Horizon oil spill shifted our perspective of who needs data and when they need it. With the help of ERMA, the public, academic communities, and those outside of the typical environmental response community can access data collected during a disaster and be engaged in future incidents like never before. Visit ERMA Deepwater Gulf Response for a first-hand look at up-to-date and historical data collected during the response, assessment, and restoration planning phases of the Deepwater Horizon oil spill. By Katie Wagner, Amy Merten, and Michele Jacobi of NOAA's Office of Response and Restoration. During the Deepwater Horizon oil spill, NOAA debuted the online mapping tool ERMA, which organized crucial response data into one common picture for everyone involved in this monumental spill.